When I asked the employees about the lack of people glued to computers, they said that the owners didn’t want to have WiFi so that people would actually have conversations and enjoy themselves (they also nodded in agreement when I mentioned the health effects). In other words, they wanted this location to be a center of the community where people preferred to spend time, which it certainly has become. If anything, the lack of WiFi has helped this cafe and the business is a resounding success. 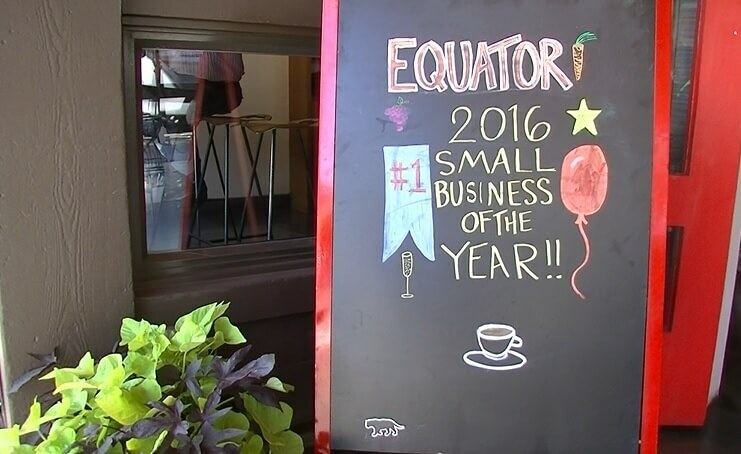 In fact, Equator Coffee has been named the 2016 U.S. Small Business Association National Small Business of the Year. Let’s hope that more businesses soon realize that their customers would rather have real in-person communication, rather than become even more disconnected via unhealthy microwave technologies. Something tells me that the need for real human connection and the growing evidence of wireless health effects will eventually pop the wireless bubble we find ourselves in today. 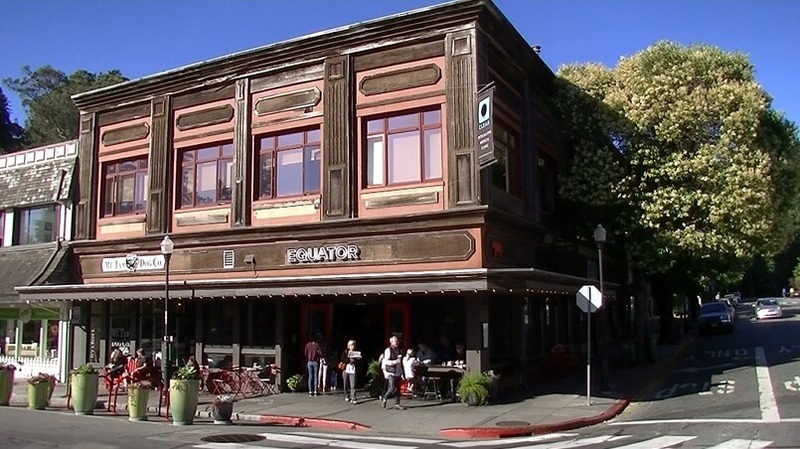 Once that happens, cafes like the one pictured below in San Francisco will become more welcoming and healthier environments. 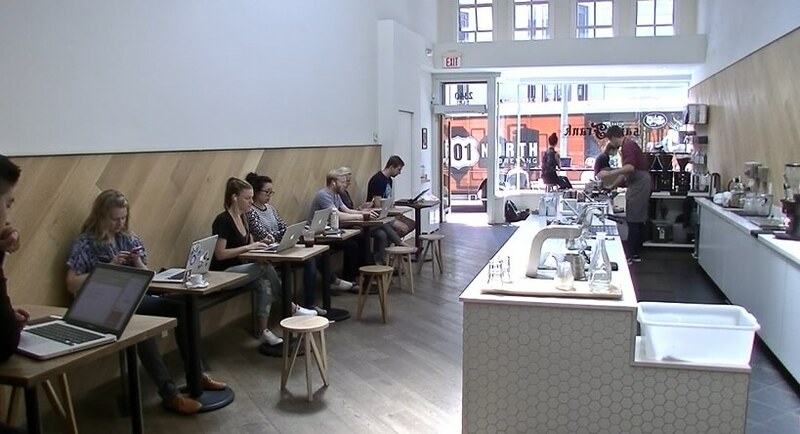 Do we want our cafes to be community gathering places or wireless office spaces? This is beautifully written. I hope other cafe’s take note of this one’s success and follow suit. It is so great to see this? Such a wonderful article Jeromy. No WiFi since their opening in 2014? Regret not knowing of this earlier, and surely appreciate your sharing this, Jeromy! CNN just aired an episode on toxins that included EMF on prime time (Morgan Spurlock: Inside Man: The Truth About Toxins). This is all great news Peter! Thanks for sharing these films/episodes. Stunning photos of the Equator Coffee shop full of lively conversation and lifeforce / chi. Contrasted with the lifeless and sterile looking SF scene. The first cafes in Arabia were known as ‘schools of the wise’ where men would philosophize and play chess. As they popped up in England, and before tea became patriotic, they were called ‘penny universities’ for a similar reason. 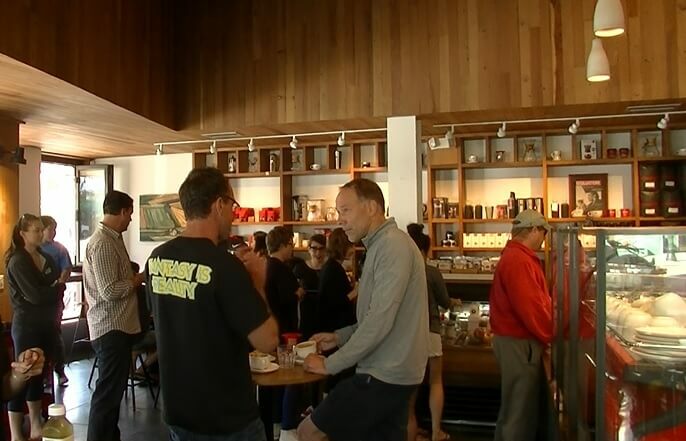 A true cafe is good for human connection, good for human health and good for the mind/fostering wisdom. May we find ourselves returning to such meeting spots once again. Thank You Jeromy! Always a pleasure reading about something good on the EMF issues. We are all so beleaguered by all the bad stuff. Wise words Walt. I could not agree more. Thanks for sharing this story Travis. I have heard similar stories from other people in the industry. They are (almost) always interested when I pull out my RF meter to show what is going on. Travis – your meter can only measure the total power density over the entire range that the meter covers. You cannot measure individual channels as you have described. In fact, a $200 meter is no more than a toy. Measurements from it have no validity whatsoever. You may want to do some do some additional reading on this topic. Travis, I have a friend who also works in the industry. Is there a possibility if I send you my email, you would contact me? My email is alpenaunclejohn@yahoo.com. I am fighting smart meters in N. Michigan. Our State Rep. is a co-sponsor of a bill in the Mi. House to allow people to keep their analog meters without any fees. The Chairman of the Mi. House Energy Commission, Aric Nesbit, is refusing the Bill to come to the floor for a vote. His term expires this year. He is going to work for Consumers Energy in Mi. as a lobbyist for them. You can see where his loyalty is, certainly not for the people of Michigan. Hi Jeromy. Thank you for bringing us this good news. There is a man named Alan Candee in the Sacramento area. I know him through the Foothill Storytelling Guild. Besides being a storyteller and a musician, Alan’s business is all about helping families find and do activities which are not related to media screens. I think his business is called ” Mindful Media Management.” His “business card” is his logo printed on a balloon. He’s a nice guy who looks a lot like Cpt. Picard of Star Trek. You can find him on line. I mentioned Alan because what he is doing is exactly the sort of business which should be encouraged. I have had to withdraw from EMF education in Nevada County, CA. because of increasing health problems. My husband and I still try to educate people about using hard wired technology whenever possible, but it’s a huge uphill battle. As an activity which was an alternative to wireless entertainment, last year I helped produce the first annual Auburn Winter Storytelling Fest. We will be providing this one day mini storytelling festival free to the public again on Saturday, January 28, 2017. This family friendly event will include a morning children’s program, open storytelling and a liar’s contest ( tall tales ) in the afternoon, and an evening showcase of experienced storytellers, with meal breaks built in to the day’s schedule. It will once again be held at the General Gomez Arts and Events Center in downtown Auburn, CA. ( Placer County ), located at 808 High Street. There will be more information closer to the time of this very fun event. Thanks for sharing this Darlene. Keep up the great work! Absolutely brilliant that they don’t have WiFi, but there would likely still be cell phone coverage in the area. And are the patrons asked to disable their WiFi or turn off devices when in the cafe? If not their devices will be emitting radiation just the same, or more, looking for a wireless connection. Long for the day when when wireless-free is like smoke-free in accommodation facilities as well as libraries, other public facilities and bars, restaurants, shops etc. I still remember the old days when people still talked in a cafe. Without smartphone or laptop in front of their faces. We recently opened our ‘Honey Bee Rose Cabin’ for rent as a vacation cabin with Ethernet wired connections instead of WiFi. We encourage our guests to turn off their cell phones when not in use and especially at night. We have had good reports from our guests sleeping well and feeling rested. One guest even stated that she was an insomniac and she reported sleeping well all 3 nights she was here. Thanks for sharing Mary. it’s usually the first time people put the dots together that EMFs may be affecting them when they have the opportunity to spend a few nights in a healthy spot. This is fantastic! A coffee shop where creative minds can flourish. Thanks Jeromy for all you do. It’s nice to be able to read your info and know someone who understands the serious dilemma we are facing everyday. It is nice to have someone who does not mock the people who are very sensitive to EMFs. Wouldn’t it be nice to have a community without all of this? This is a good start in the right direction. It took 100 years for humanity to completely disconnect from Nature. While it took 10 years only to disconnect from each other even over a cup of coffee. I prefer to take my cup of coffee in Starbucks Coffee Shop, NOT in Starbucks Internet Cafe! I always thought it would be so cool if a bunch of people got together and bought land, and built apartments making sure it is WITHOUT wi-fi…so the people that live there have only wired, with only analog meters. Built with non-toxic material and eco-friendly paint and lots of beautiful plants, without toxic chemicals used. While I am at my dream building, have these apartments so there are noise level rules, such as no loud music, so people can live a healthy lifestyle in an apartment to sleep well. I don’t live in an apartment but used to and remember all the issues that go along with it. A non-smoking building…and the people living there would have ample space indoors and outdoors for a garden with veggies and herbs, and they clean with only things like white vinegar, baking soda, etc. Hi Danielle, There is a small community in the Dallas area for people with EHS and MCS. Houses rent for $120/night, $2600/month. They are booked forever in advance. There is also a potential property opening up in Northwestern Colorado. We will know more about this in the coming years. Wonderful to see this healthy cafe. Reminds me how far from a normal healthy society we have been driven since the 80’s. Hopefully we can turn the tides from now on. What an inspiring article…thank you Jeromy for sharing this real life example. I wish more places were WiFi free. Thanks Susan. Hopefully this is just the beginning. Thanks for the post Jeromy. Folks may wish to check out Werner Herzog’s new movie, Lo & Behold. It’s about the pros and cons of technology, including a visit to EMF free Greenbank, West Virginia. The trend continues. . . Here is a location that bans WiFi and, of all things, actually encourages people to read books! The trend continues. . . . here is a location that has turned off the WiFi so that people will read actual books!